Steve Donahue was introduced as the John R. Rockwell Head Coach of Men’s Basketball on March 17, 2015 and is in his second season as the 20th head coach in program history. The Quakers went 11-17 overall in Donahue's first season -- their highest win total since the 2011-12 season -- and finished in fifth place in the Ivy League with a 5-9 conference mark. Senior center Darien Nelson-Henry was a second-team All-Ivy selection. Donahue’s hiring marked a return to Penn for the Delaware County native; he was an assistant coach for the Quakers under Fran Dunphy from 1990-91 until 1999-2000. During that 10-year span, Penn won six Ivy League titles including four separate undefeated conference campaigns, compiling a 182-91 overall record that included a 114-26 mark in Ivy play. Nat Graham was hired in May 2014, and is in his third season as an assistant coach on Penn's staff including his second reunited with the Quakers' current head coach, Steve Donahue. Graham returned to his alma mater after spending four seasons at Boston College under Coach Donahue, three of those as associate head coach. He joined the Eagles for the 2010-11 season after serving the previous five seasons as an assistant coach under Donahue at Cornell. Graham helped guide the Big Red to 111 victories and three Ivy League titles in his five years. In 2009-10, Cornell finished with a 29-5 mark and advanced to the Sweet 16 of the NCAA Tournament. The Big Red established school records for wins, points (2,545), three-pointers (326), and blocked shots (127). The season marked the program’s third straight 20-win campaign. Trey Montgomery was hired in August 2018 and enters his first season as an assistant coach with the University of Pennsylvania men's basketball staff. 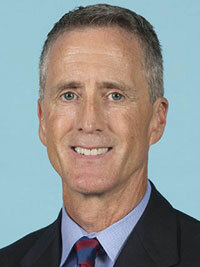 Montgomery spent last year as an assistant men’s basketball coach at Eastern University in nearby St. Davids, Pa. Prior to that, he spent four years as an assistant coach at Destrehan (La.) High School and coached the U-14 AAU Louisiana Legends team. Montgomery played college basketball at Division I Samford University in Birmingham, Ala., where he was a four-year letter winner and two-year captain under head coach Jimmy Tillette. One of the best floor generals in Bulldogs history, Montgomery finished his career with 1,030 career points (19th in program history) and more than 350 rebounds, 200 assists and 100 steals. He made 112 appearances including 88 consecutive starts to end his career. Joe Mihalich Jr. was hired in April 2015 and enters his second season as an assistant coach for the University of Pennsylvania men's basketball program in 2016-17. A Philadelphia native and the son of longtime Niagara and current Hofstra head men’s basketball coach Joe Mihalich, the move to Penn marked a return to the area for Joe Jr. He spent two seasons as a graduate assistant with the men’s basketball program at Villanova University under Jay Wright, working directly with the Wildcats’ director of basketball operations; organizing and overseeing team and summer camps; and helping out with academics, scouting and recruiting. During Mihalich’s time with the program, Villanova posted a 46-20 record and made two NCAA Tournament appearances. Prior to his arrival at Penn, Mihalich spent four years at the University of Scranton (Pa.) as the Royals’ assistant coach under head coach Carl Danzig. There, his primary responsibilities included recruiting, scouting, player skills’ development, overseeing daily operations, and development and implementation of game and practice plans. After spending five seasons with Steve Donahue at Boston College, Brad Fadem made the move to Philadelphia in May 2015 and is in his second season as the director of operations for the University of Pennsylvania's men's basketball program. The move represents a return home for Fadem -- who grew up in nearby Devon, Pa. -- as well as a reunion with Coach Donahue, who is in his second season overseeing the Quakers in 2015-16. Overall, Fadem spent six seasons with the BC men’s basketball program, four as an undergraduate manager and two as a graduate manager. As an undergrad, he traveled with the Eagles to Spain in August 2012. As a manager, Fadem assisted with the team's video and film, off-season workouts, and recruiting-related tasks, while also organizing the managers' work schedules.